"My husband yet again I believe is sleazing around and would like to see what he has deleted off of his iPhone…I just need to know if my suspicions are yet again true so I can make the decision to leave him or not. So, how do I view deleted safari history on iPhone?" Maybe not all of us want to view deleted safari browsing history due to this reason. But no matter why, we can recover deleted safari history from iPhone/iPad/iPod to computer if we want to see them. And this article introduces 3 flexible ways. A Windows PC or a Mac. The iDevice whose safari history you want to recover. Way 1: Simple steps to get deleted Safari history back with 3 optional modes. UltData is a program specializing in iPhone safari history recovery. 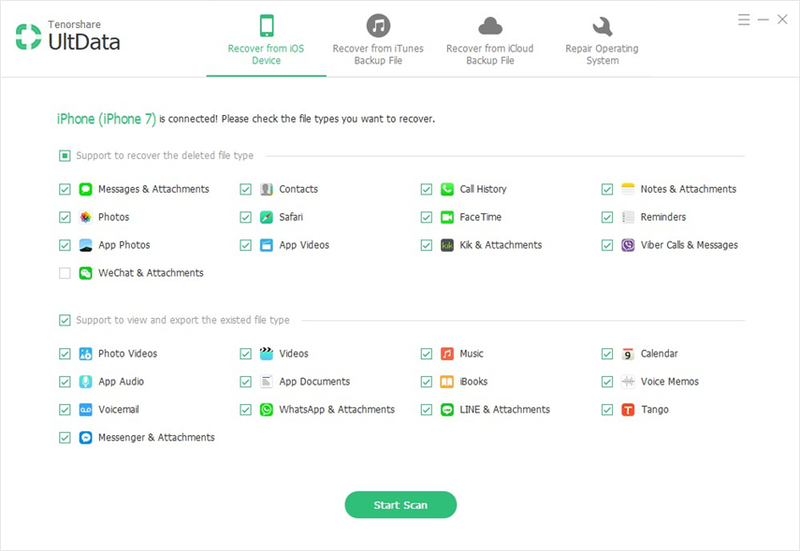 In addition to recover deleted history on iPhone Safari, it can also retrieve Safari bookmarks, notes,photos, messages (texts, WhatsApp, Tango, Viber), contacts, etc. from iPhone Xs/Xs Max/XR/X/8/8 Plus/7/7 Plus/SE/6s (Plus)/6/5s/5c/5. It enables us to retrieve deleted private browsing history from iPhone directly and from iTunes/iCloud backup files, which highly increases the possibility of data recovery. The first as well as the commonest way to view deleted safari browsing history is to scan iDevice directly. No need of backup files. Step 1. Install the data recovery program on your computer and connect iDevice to computer via the USB cable. Step 2. Click "Start Scan" to scan the data in your iPhone, iPad or iPod. Step 3. Go to "Safari" category in the left section and tick the browsing history. Then click on "Recover" to recover safari history iPad, iPhone, iPod. Compared with the way above, recovering safari history on an iPad/iPhone/iPod using iTunes backup has its advantages as well. For example, it will be more helpful if iDevice is factory restored, or the browsing history was erased due to iOS update failure. But we have to make sure that we have backed up our wanted safari history. Step 1. Install the data recovery program on the computer where your iTunes backup is located. Then run it. Step 2. Select "Recover from iTunes backup files" from the program's main interface. Then select the iTunes backup that you need according to its name and date. Step 3. Go to "Safari" on the left and check your wanted safari history and click "Recover". If you have synced the safari history of your iPhone, iPad and iPod using your iCloud account, you can use "Recover from iCloud backup files" mode as well. It is similar to No.2 way. Step 1. Install the program on a computer. 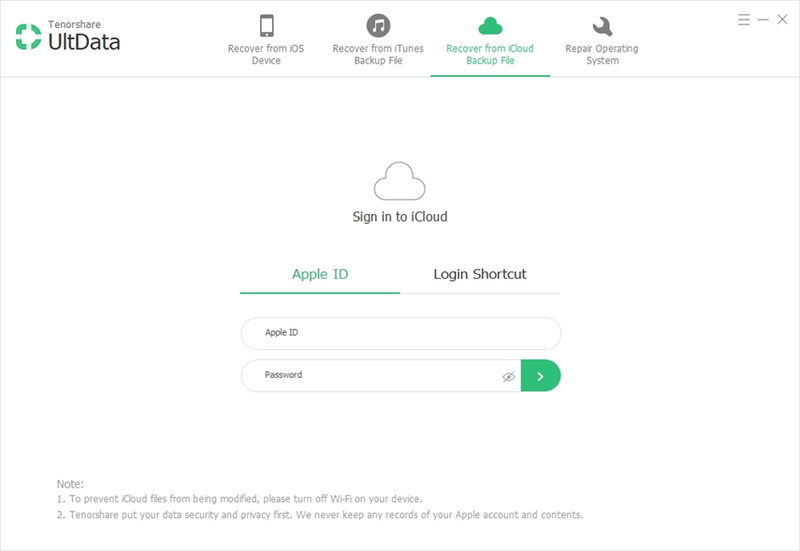 Specify "Recover from iCloud backup files" mode, and then sign in your iCloud. Step 2. All backup files of this iCloud account displays. Select the one you want and click "Next" to download its content. Step 3. Check your wanted items in "Category" and hit on "Recover". You can also easily restore your Safari bookmarks and reading list via iCloud.com. Here's how you can do it. Step 1: Go to https://www.icloud.com/and sign in. Click on the Gear icon to open the settings section. Step 3: You should see available versions listed by date and time. Click "Restore" to the right of the version you want to restore. I find that it's not so complex to recover deleted safari history with way 1. There are 3 options for us to choose. It's seems more convenient. In summary, this article provided many useful ways for people in need. Choose Tenorshare Ultdata(iPhone Data Recovery), choose simple life style.